Just registered with Tabletopia and need a helping hand with getting started? Read this short guide to start playing in 4 easy steps. On game’s page: Click a game’s box in All Games or use Search to find a game and go to its page. In the game room (the place where the game is set up for play): Click in the bottom left corner of the screen to open the rules. Join: Go to Find & Play and click any game that is now open to join. Wait for the host to start the game. Create: Find a game you want to play using Search or filters in All Games. Click Play Now! to host a game. 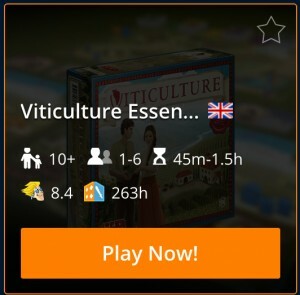 Find: Visit our Discord channel or find people in common chat on Tabletopia. To play with friends outside Tabletopia, send them the room URL—they will play in browser for free. 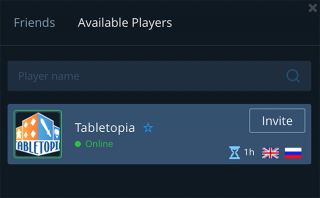 To invite other Tabletopia users, click “Invite players” and send invites. To make your room visible to others, check “Show in Find & Play” and wait for people to join. Read Interacting with Game Components. Click in the bottom left corner of the screen in the game room to open in-game Help.